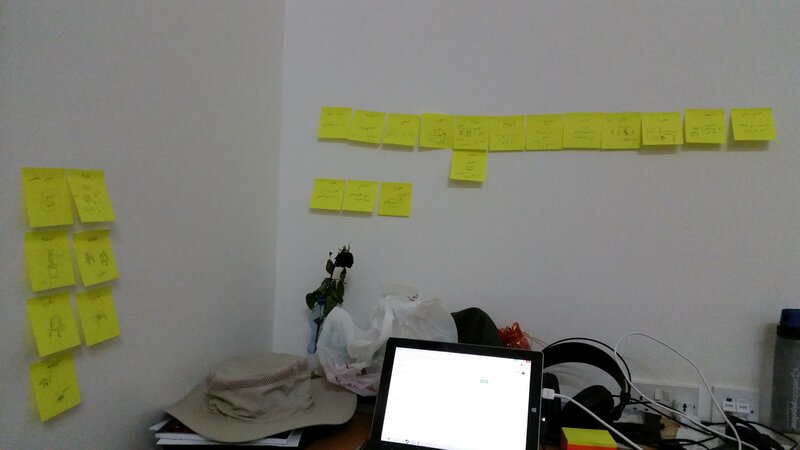 June 2015 – Oh Man, Oman, Man! Hello again, I’m sorry it’s been so long since the last blog post. It’s been a pretty hectic time because of the start of Ramadan! So I suppose my factoid for this blog post will be about Ramadan. Ramadan is a holy month (determined with a lunar calendar) in Islam practiced since the time of Muhammad. Each day during Ramadan, adult Muslims are required to fast from dawn to sunset – meaning no food and no water! There are of course exceptions for those who are sick or traveling. In addition, Ramadan in general is a time of heightened piety for Muslims in Oman and throughout the Muslim world. For example, lying, cursing, and talking behind someone’s back, while frowned upon at all times, are particularly discouraged during Ramadan. Even non-Muslim women in our class were asked to wear the full hijab, the head-covering that some Muslim women (and nearly all that I’ve seen in Oman) wear in public. Men were also asked to wear long-sleeves at all times. I definitely wasn’t expecting that, but I have no issues making small adjustments to respect the culture here, especially since I’m a guest. Because of the fasting, many Muslims shift to a more nocturnal schedule during Ramadan. Muslims listen for a call to prayer to break the fast around 7:00 in Oman, and they eat a very small meal called Iftar to prepare for dinner. It’s customary to break one’s fast with a date as Muhammad did according to the writings about his life (known as the Hadith). Some Muslims eat the equivalent of a lunch at around 10:00, and then most eat a breakfast-like meal called Suhoor at 3:30 AM before another call to prayer at 4:00. Most I think sleep until 3:30 and get up briefly then, but some of the students in our group who are fasting just stay up until then. My conversation partner Ibrahim suggested that I fast just for one day to see what it was like, so I fasted on the first day of Ramadan, last Thursday. I fasted the correct way – no water, no food, and not even any gum. It actually wasn’t unbearable, especially since we didn’t really do much that day. I decided to continue the next day – it wound up being pretty easy because I slept in until 3:30 PM, so I only had to fast for a few hours. I decided to stop though because I didn’t want to disrupt my ability to focus during class. So anyways, a lot of interesting small things happened last week. Last Tuesday, we had a Cultural Evening (Umsiyya Thaqafiya) at the Sultan Qaboos College for Teaching Arabic. We spent a few days after we got back from Muscat preparing for the evening, which consisted of two parts. One hour was made up of poster presentations like a science fair where we talked about any aspect of our respective cultures (in Arabic, of course!). My friend Eman, a Japanese-Egyptian student here presented on Japan with another American student who studied abroad there before. I talked about Blues and Rock music. There was also a presentation about the South with sweet tea, and another about Texas with guacamole. There were others displays as well as some made by Omanis about Ramadan and Omani food. The text for my displays. The second half of the evening consisted of performances. As you might guess, I sung and played that classical guitar that I found earlier in the trip. My friends know I’ve really played this song to death, but since I have a new audience I could play it yet another time: Nobody Knows You When You’re Down and Out. Before I sang in English, I had to demonstrate my Arabic ability in some way, so I decided to translate the lyrics to Arabic and read them to the audience (which I think consisted of at least 100 people). I wasn’t planning to before, but I decided halfway through the song to try to sing in Arabic. The phrasing was a little weird, though, so I switched back to English in some parts. There were some other performances from the students in our program. The students from Texas sang “Deep in the Heart of Texas”, and another read some poetry in Arabic. We were able to see some Omanis perform the ‘Azi (a traditional military exercise thing that’s really hard to describe), and the men in our group were even able to participate. At the end of the presentation I joined the group of performing Omanis with another student from our program, and I talked with all of them for almost an hour in Arabic about a few things like universities in the US, what there is to do in Manah, and studying Arabic. I caught a video as we were all parading out together. The night was a lot of fun and a huge success. The next day we celebrated the 3rd anniversary of the college with a traditional Omani meal at lunchtime – beef that had been roasted in a fire pit called a Tanoor for 24 hours. According to everyone who ate some, it was delicious. I tried a couple pieces and wasn’t a huge fan, but I think that’s just because I have only really had one other bite of steak in my life (in Yellowknife). One of the bites that I had – looks like a good piece..? Thursday, we had a presentation on Omani proverbs and learned about the traditional clothing for Omani men. The long garment is called a dishdasha and the turban a musar. There is also a cylindrical hat called a kumma that is worn by itself or under the musar. We spent the weekend sleeping and shopping at the Souqs in Nizwa and Muscat. I was able to buy a dishdasha for only about 15 dollars! Also, it’s rained here more times than I’ve expected (thrice). Following up on part 1 of the trip on Sharqiya, I’ll be talking about our Friday and Saturday now. In the morning, we woke up to ride both ATVs and camels in the desert! I started with the ATV, which was really wild. I’d never ridden one of those before, and I’m fairly certain I almost flew off at one point. We were supposed to stay together in a line, but I purposely waited back a couple times so that I could rev up the engine and go forward full speed. After the brief ATV ride, I was able to ride a camel. It was pretty simple; I just got on as the camel was sitting down, and then an Omani kid led the camel around for a few minutes. I never realized how tall camels are! Once I was up there, I realized that it would not be pleasant if I fell down. It also wasn’t as uncomfortable as some people made it out to be. One thing that was a little scary was that when the ride was over, my camel refused to sit down for a moment and started to back away from the person leading it, but it did after a few attempts. After that, we planned to head to Sur, a region on the coast of Sharqiya, to go to a beach to see where hundreds of sea turtles lay their eggs. But we ran into quite a setback: the road we had planned to take ran right through a wadi that was now flooded in several places due to the storm. We definitely couldn’t have driven through it, so we could either have waited to see if the flood subsided or driven through Muscat and around to Sur. Despite it being a four to five hour drive, we took the second option because we had no idea how long we’d have to wait. As we were driving to Muscat, however, we got a call from the hotel in Sur that the weather was far too violent due to the tropical storm and that we should go at another time. Through a stroke of luck, our director Talal managed to get us a night at the Millennium Hotel, a five star hotel in Muscat! On the way there, we stopped for lunch at a traditional Omani restaurant. Surprisingly, this was the first time I ate real Omani food! Unless I wanted to eat yogurt and rice, I had to eat some kind of meat, so I got fish. I think it was kingfish but I’m not really sure. The dish that I got was Mandi rice with fish. The rice was actually a Yemeni variety, but the fish was Omani. It was excellent – definitely some of the best fish I’ve ever had. It was a lot of fun too because we sat on the floor and ate with our hands. I have to say, there’s a special technique to eating rice with one’s hands that I was not able to figure out. We were given no forks. The hotel was pretty incredible, and we even had a room with a separate toilet and shower! We spent the rest of Friday and Saturday relaxing, swimming at the pool and in the ocean, and eating ridiculous amounts of food. There was also a bar, but I elected not to drink anything other than a (non-alcoholic) smoothie. Tart with passionfruit and dragonfruit, chocolate mousse with a ground cherry on top! Everyone at the hotel spoke English, but I impressed them a few times with my Arabic. I asked for a towel at the pool in Arabic. There was a little confusion at first though because I asked for a bedsheet at first (sharshaf) when I meant to say towel (manshafa). 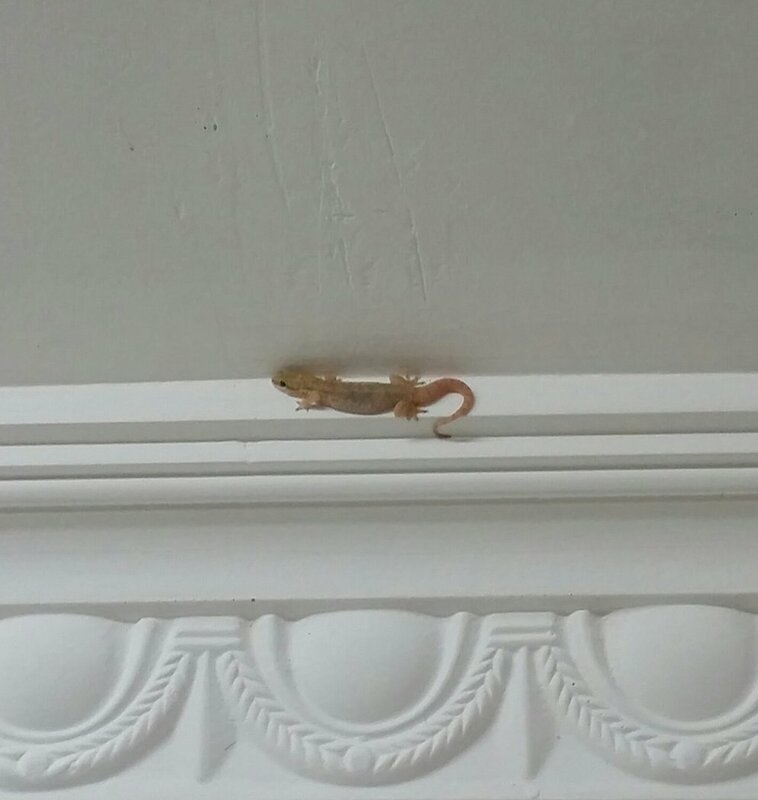 I checked out from my room in Arabic as well. Well, it’s been quite a busy week, so I’m a few blog posts behind. We had a three day trip to the Eastern region of Oman, Ash-Sharqiya, which I’ll talk about in two separate posts. Have you ever heard the stereotype of Americans being ridiculously loud? I always figured that was just something people said, but after I’ve been here and spoken with so many Omanis, I can say that it is definitely true that we are really loud people sometimes (myself included, of course!). Being with a large group of Omanis, for example, it was not necessary to have a shouting match to try to have a normal conversation. Whereas a room full of Americans seems to get louder and louder because of people trying to talk over each other. I can’t say why this is; it’s just something I’ve noticed, and something I assumed was the norm everywhere until I came here. This past weekend we had planned to visit Wahiba Sands, a sand desert in the Sharqiya region, and then go to the coast of Sharqiya to see a beach where hundreds of sea turtles lay their eggs. As you shall read, however, our plans had to change because of a tropical storm. We began our trip on Thursday, starting the weekend a day early. We left in the morning and stopped by a famous wadi, Wadi Bani Khalid. I think I wrote this before, but a wadi is a riverbed that floods very quickly during rainstorms, or in the case of Wadi Bani Khalid, is always a flowing to some degree. And the potential for flooding became a complicating factor: we drove through the (dry) wadi to a natural pool at the end, but we were only able to stay for 30 minutes because it was going to flood at any time due to the impending storm! Another view of the pool – I jumped from here! The water was incredibly clear and just the right temperature. It was pretty clean as well, apparently, because I accidentally swallowed a sizable gulp due to poor swimming technique. After our short swim at the pool at the end of the wadi, we headed off to our next stop: the Arabian Oryx Camp in the Wahiba Sands desert. We had to stop and switch from our two buses to a fleet of cars with special tires for the sand. Our “tents”. They had everything one would find in a normal hotel room. A dried out pomegranate we found near the wall of the camp. The Camp was a genuinely unique place. We were told that we’d be staying in tents, but they were a bit more like trailers or something like that. They had a cloth roof, but full walls, windows, and wooden doors. They also had their own bathrooms with showers and running water, so we were much more comfortable than we thought we’d be. We had lunch at a buffet there, napped in the afternoon, and then set out in our fleet of cars to check out the desert in the evening before dinner. As you can see, it was actually very cloudy and pretty comfortable heat-wise, so it was a good day to explore the desert. We drove over some pretty steep dunes. Another shot of the camp. Some bedouin houses out in the desert. Sand as far as I could see, in all directions. I really couldn’t get over how pretty the sand was. That desert was unlike any place I’ve ever visited. It’s hard to describe how I felt being encircled by all the sand, surrounding me and flying around me in the wind. It was almost like a religious experience; I’m not really sure. But I feel drawn to the desert in a way that I don’t fully understand. My dream house wouldn’t be at the beach or in the mountains – it would be a bunker way out in the middle of the sand dunes. Right after we got back, we tried to climb to the top of one of the huge dunes near the camp and sled down in the sand, but it didn’t really work to well. Climbing up the loose sand was exhausting, but it was also pretty fun. We had to get down from the dune pretty quickly, though, because we saw some intense lightning flashes from the storm! That evening, we had another buffet at the camp, and then we were able to see a traditional Omani band play. This was probably my favorite thing I’ve done here so far. The music was incredible – usually led by an Oud accompanied with several drums. One of the musicians also played bagpipes for one song. My favorite thing about the music was that it was very informal and jam-based. Even though the Oud sounds and looks very different from the guitar, a lot of the Oud player’s mannerisms were like those of a guitar player, such as how he took solos and ended songs. I was even able to try out the Oud, which was surprisingly not as different from the guitar as I thought it would be. I’d like to buy one someday, but bringing one back would wind up being quite a hassle. They also let us play the drums with them for a lot of their songs. Unfortunately, they asked that we don’t put pictures on social media (or at least that’s what I think they said – this was requested in Arabic), so I won’t put any here. I have pictures and videos that I can share in person when I get back. I was completely covered in sand at the end of the night – you can see a little in this picture. Good food for being way out in the middle of the desert! We had an even fuller day following Friday, which I’ll talk about in my next post tomorrow. I just wanted to make a quick post to share a few photos and talk about my actual classes this week, since they’re why I’m here! The view outside the college – just some random buildings. My classes in Arabic are structured as follows. We have two separate classes with different teachers. First, from 8:00 AM to 10:00 we have Media Arabic class, then from 10:30 to 12:30 we have Grammar class. We have discussions and activities in both, and we usually have a set topic for the week in the Media class. For example, we talked about human rights this week and made posters for specific rights today. My group’s was the right to peaceful protests. We discussed the differences between rights in Oman and rights in the United States as well as the U.N.’s Universal Declaration of Human Rights. 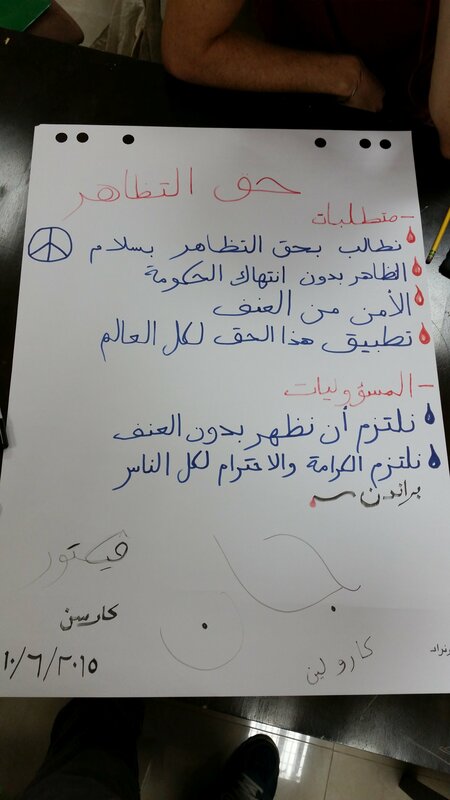 Our poster explaining the requirements for peaceful protests – both for the protesters and the government. Twice a week in the evenings, we meet with our conversation partners. I can definitely tell that my Arabic is improving – even if I’m not learning new vocabulary at the rate that I’d like, I’m much more comfortable now with the words that I already knew. I went for a walk with Ibrahim, my conversation partner, and was able to talk for a few hours only in Arabic. I explained the NSA, the differences between Democrats and Republicans, the next election, and other things. An old mosque that we came across while walking. Another old mosque we found on our walk. We also had sports night Sunday with our conversation partners. I played volleyball and soccer; I was pretty bad, but I still had fun. The girls in our group did Henna with their conversation partners while we were playing sports. They had sports night the following day. Tonight we had a very cool lecture about the Royal Opera House in Muscat that I visited last weekend. Dr. Nasser al-Taee, a former professor at the University of Tennessee talked about the mission of the Opera House as well as his theories about the relationship between East and West, citing Edward Said and Orientalism. The mission of the Opera House aside from entertainment is Cultural Diplomacy – to foster cooperation and understanding internationally and specifically between the West and the Middle East by presenting Middle Eastern culture in forms comfortable to the West. He mentioned Gandhi as a good example of the understanding the Opera House hopes to achieve. Gandhi learned English and spoke in English when he was communicating the British but his end goal was still sovereignty for India and its culture. I’m not sure if what I’m saying makes sense, but I’m writing this more so that I can remember what happened than to give a detailed account. Well, this is going to be a long post. For some reason I no longer have internet in my room, so it took a while for me to get all of these photos uploaded, but here I am now. Have you ever spoken with someone who didn’t understand English well, had them not understand something, and you just repeated the same thing more loudly? I’d like to say I haven’t done that, but I think I’m guilty. It’s a pretty weird thing to go through, and it’s happened to me a couple times. Some of the words can wind up being pretty hard to figure out as very few sound anything like their corresponding English words. Last weekend, I had an exhausting but fun trip to Muscat, the capital of Oman. It’s where we arrived on the first day, but we didn’t really spend any time there. We started Friday (I’m not sure if I mentioned this previously, but Friday and Saturday make up the weekend here: Sunday is the first weekday). We got up and were on the bus by 7:30 in the morning, and our first stop was the Royal Opera House. Sultan Qaboos is a huge fan of classical European music – and that was very clear to me after our visit there. Everything was polished, ornate, and decorated. The lighting was weird in the actual theater area so unfortunately I don’t have any good pictures from there. Too bad they’re stuck behind the glass…. The waiting area outside the theater. 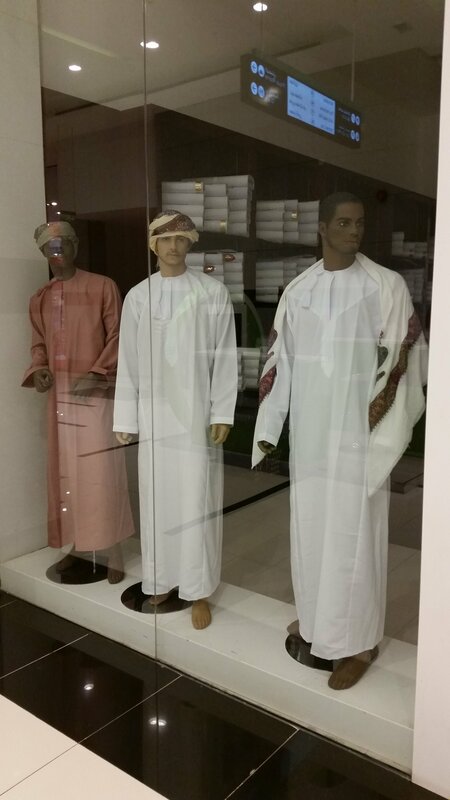 I just thought that this was worth documenting – all elements of traditional Omani dress. We went to the Muscat Grand Mall after that, which wasn’t very interesting because it had mostly Americanized stores. The only stores I would have wanted to visit were closed. We had some free time to hang out in the hotel in the afternoon, then we went to the Matrah Souq in the evening. It was a sprawling market with several shops where one could buy just about anything. Honestly I didn’t even get to see that much of it, as two hours really wasn’t enough. I went with one of our supervisors from the college, Malik, to try to buy a dishdasha, but I just decided that I would wait until later. I don’t have any pictures from the Souq, but Khalil has a funny video of me trying to barter with someone that I’ll most likely be able to post in the next few days. Hopefully I’ll be able to go back and actually buy a few things before I head back home. Some of us went to a Shisha Cafe later at night, which was fun because I spoke with an Egyptian guy there who was very impressed with my Arabic. Before I left I just said “I’m a crazy foreigner, I don’t speak Arabic well”, which he thought was pretty entertaining (transliterated Arabic: “Ana ajnabi majnoon, la atakallam al-‘Arabiyya jayyidan!”). That concluded day 1 in Muscat. Day 2 was the intense one. We began Saturday at 8:30 with a visit to the Sultan Qaboos Grand Mosque. Honestly, I was as impressed visiting it as I was visiting the Blue Mosque in Istanbul. It’s very pretty on the outside, and it’s really hard to fathom how big the main hall is inside. I’m certain that my family’s house at home could fit in the center comfortably as my pictures don’t really capture the size. The women’s prayer hall is far smaller and less ornate than the men’s – our guide gave us an interesting reason for that which I can explain if you ask me but that I’m not going to write here. Where the imam stands to lead prayer. Another shot of the dome. The dome at the top of the mosque. The mihrab of the mosque – indicating the direction of the Ka’aba in Mecca. The designs were this intricate on every wall. In front of the mihrab. In the courtyard – a good view of the dome that I photographed on the right. After that, we went to a museum in Muscat. I wasn’t able to take pictures but I learned some interesting things about Omani clothing and traditions. After that, we had my favorite part of the trip – a boat ride and snorkeling trip in the Oman Sea of the coast of Muscat! I saw a lot of cool creatures that I’d never seen before, like some cool rainbow fish, a pufferfish and live coral. My favorite creature I saw though, was a cuttlefish. That was totally surreal. I’d seen cuttlefish before on T.V., but I never realized how weird they really are. It wasn’t flashing like they usually are in videos, but it was camouflaged with the coral, which was just as cool. At the center of the boat – the real Omani treatment. The bay where we snorkeled. Our boat – two stories tall. I jumped from that top part. Another shot of the bay. Another cool, solitary boat out in the sea. The back of our boat. One weird thing was that I got very seasick one the way out and back from the cove where we swam. I’ve never gotten seasick before, even in a smaller boat blasting across the Great Slave Lake or on a larger cruise ship in the Aegean Sea. My favorite thing that afternoon though was probably overcoming my fear of heights to some degree. The video doesn’t do it justice, but I jumped off the top of the boat into the water, which was probably about a two story jump. Of course plenty of others did it without hesitation, but I was proud of myself either way. I did it twice. We were all very tired by the time we got back to shore, but we still had one more stop planned: Sultan Qaboos’s Grand Palace in Muscat! We were only able to look at it from behind a fence, of course. One of the palace guards. Even after that, we still had a two-hour bus ride back to our Guest House in Manah. Needless to say, I’m still tired from the weekend! Anyone care for a Fatburger? Can you tell how tired I was? I’m making a short post just to share a few photos. Today we had practice with our conversation partners, and I spoke only in Arabic for about three hours. I can feel a bit of a shift happening, but it’s still pretty difficult to me. Of course it’s not really reasonable for me to expect myself to suddenly find speaking and understanding Arabic easy after only doing it seriously like this for a week. Khalil has a cheap classical guitar that he is letting me borrow (it was on the top of the cabinets in one of the classrooms), so I’m very happy about that. I made a pick out of a water-bottle cap. I know classical guitar isn’t supposed to be played with a pick, but I’m hoping to play some non-classical songs at a Cultural Night later, so I’m making to with what I have. And wow, Oman is not the place to be for those with a phobia of bugs. We found a camel spider trapped in the drained swimming pool on the Guest House complex, which was one of the creepiest things I’ve ever seen (although pretty much harmless to humans). Tonight at dinner there was a huge commotion when people saw a scorpion running across the floor, but I jumped up quickly and was able to catch it in a cup, after which my roommate flung it over the wall. 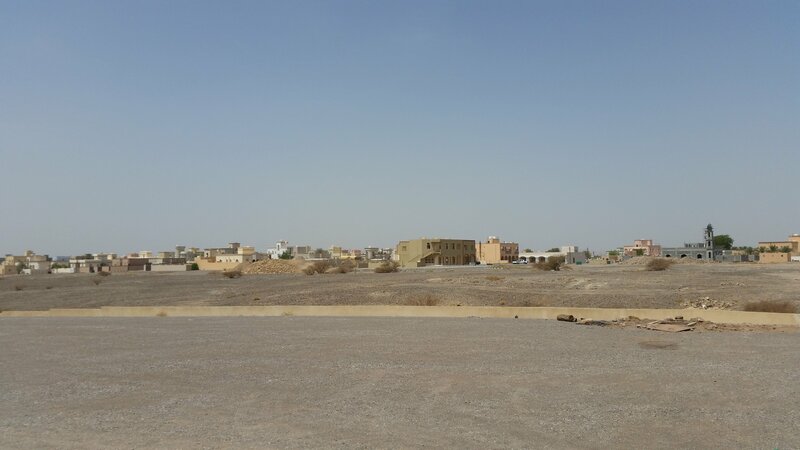 I'll be in Oman until the end of May studying in Ibri at the Noor Majan institute, so I'm writing here as a journal for myself and for my friends and family to see what I'm up to. Previously I documented my time in Oman in the summer of 2015 with the SALAM scholarship through this blog.